Since its invention in the early 1970’s, the unprecedented diagnostic value of Computed Tomography (CT) has been demonstrated in many clinical fields. 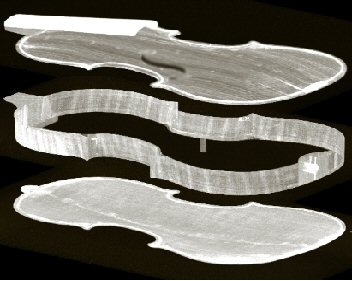 Also in non-medical fields, however, the value of CT has been explored… In 2007 Berend Stoel started, together with Terry Borman, exploring the value of CT in ‘diagnostics’ in classical violins. For a full example of such a report, see the site of Instrumental Insight.